The promotions for the forthcoming full tour to Australia by India have been on in full force on TV in India. These promos are a source of some mirth and a lot of unintended comedy. We have had former cricket stars hyping the event as “Thunder Downunder”. Shane Watson has the unenviable task of lecturing us on meteorology and climate adadptation. Through these promos, we are reliably informed that, while it is winter in India it is summer in Australia. Saurav Ganguly talks up the series as the ‘battle of the chirp’, referring to the mental fortitude that is required for teams to tour Australia. Bollywood stars have got in on the act. The tour has been called the “Agneepath” (“Path of Fire”) Series. It helps that a movie by the same name is due for release shortly! Product placement meets TV meets cricket. An India v Australia match-up has not, in the past, required any additional marketing. Fans of both countries relish the contest. The Border-Gavaskar series had the potential to be billed as The Ashes of the new millennium until Australia lost its sheen. Nevertheless, since the 2001 epic in Kolkata, Boarder-Gavaskar Trophy clashes between Australia and India have marketed and sold themselves. And if interest in the BG Series flagged at any point in time, that Test in Sydney in 2008 ensured that Australia-India Tests would always retain an interest around the world of cricket. The Border-Gavaskar Series was an opportunity for the most powerful team of our generation to meet the most powerful team of our generation. It presented an opportunity for the strongest team to meet the richest team; an opportunity for the most talkative team to meet a team that was finding its voice (at times, even a provocative rude voice). Every series saw drama, emotion, guts, glory, evictions, fights, breakdowns, fight-backs, back-stabbing, court-room trials and more. This was Survivor meets Big Brother meets TV meets cricket. Always! So, the additional chest-thumping marketing promos have been somewhat strange and mostly unnecessary. However, India did lose to England in the 2011 English summer. Badly! Most Team India fans have worked hard to try and banish the horribly painful memory of that loss deep into the recesses of their minds. England in 2011? India went there to play? Play cricket? No way! Subsequent to that series against England, India has made a few small but significant changes in personnel, although the approach has not been changed substantially. India beat England in an ODI series and then beat a hapless West Indies. But both of these series were at home. In India. In familiar conditions. So, it is hard for us to gauge the impact of the reorganization and the restructuring that was necessitated by the horrible English summer. Moreover, the injuries that plagued Team India in the horrible summer tour of England persist. These have not vanished. India has had to identify, groom and prepare new resources. Quickly. Meanwhile, Australia is caught in a funny place. We cannot be sure whether they are in consolidation phase or rebuilding phase or start-up phase! That is how unsure the Australian cricket team is looking these days. The cocky sheen has been replaced by an immature diffidence. Australia present an image of a child eager to — and, at times, able to — peddle fast on a bicycle when it can’t remember if it has taken its first baby steps in life. It looks like a team what needs a “re” prefix to describe the process of transformation that it is undergoing, without being sure if it is resurgent, rebuilding, regrowth, regeneration or revival. After the terrible Ashes loss at home at the hands of England (again! ), Australia went about the rebuild that was required in a typically Australian manner. The result was the Argus review. A public enquiry was conducted. All stakeholders were contacted and interviewed. A tome was written. This series provides an opportunity to assess the status of the sweeping changes brought in by the Argus review. Australia has new selectors, a new coach, a new coaching system, a relatively new captain, and a new T20 league. All of these were intended to arrest the reversals over the last couple of summers. All of these will be under scrutiny. The challenge will be to show demonstrable improvements, and fast. The first few attempts at regeneration have been very mixed. A good session is immediately followed by a bad session. In the past few months the team has demonstrated excellence and weakness, strength and vulnerability, solidity and inconsistency, toughness and fragility — all in equal measure. All of this has turned the pre-series Australian Press ritual on its head. What we normally have every (Australian) summer is the Australian press attacking the visiting opposition captain and key players in a remarkably organised pack-mentality. This ritual would often commence a few weeks before the first ball is bowled. The opposing team would be made to feel the heat and the pressure before the first toss. A siege-mentality would often grip visiting teams even before the actual cricket commences. However, this time around, the Australian press is internally focused — almost entirely. Should Ricky Ponting retire? Should Usman Khawaja play? And if so, at what position? What happens to Phil Hughes now? Why are there so many injuries to key players like Mitchell Johnson, Shane Watson, Shaun Marsh, Pat Cummins, Ryan Harris, et al? These are some of the questions that have to be asked. And key press outlets in Australia have started this postmortem. The questions and barbs from the Australian media are being directed at the hosts this summer. There are self-doubts. These need addressing much more urgently than the potential gaps and vulnerabilities of the opposition camp. The Australian press is internally focused. So, this series does provide some interesting story-lines. Some these will be distractions. Others will surely affect preparations. For India’s senior soldiers, this is the “Final Frontier”. A win in Australia will check off another item on the bucket list of the “Triumphant Trinity”! (Ok, we were struggling here after the Fantastic Five became the Fabulous Four!). The Trinity has come close to a victory in Australia in the past. But the team lacked the killer punch; that finishing touch. 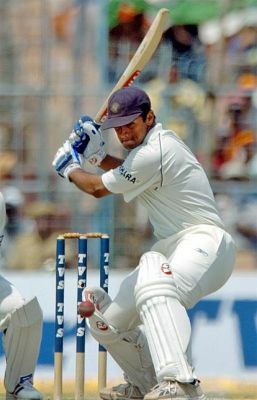 Sachin Tendulkar will be eager to get the 100th 100 completed. [Editorial Comment: Under normal circumstances, we may have said “Tendulkar needs to get that monkey off his back.” However, that would be a tad insensitive for an India tour of Australia! So the Editor culled that cliche out of this piece!] If Tendulkar does not get to his 100th century early on in the tour, this distraction will become as unbearable in the Australian press as it has already become in the Indian press. That distraction is one that the team does not need. There is a risk of the series becoming a Ricky Ponting farewell tour — that is, of course, if the retirement does not happen before the tour commences. The 2003/04 series became a distraction for the home team as Steve Waugh’s retirement took center-stage in Australia. A Ricky Ponting farewell tour would be a needless distraction on a side lane when the team is struggling to cope with driving the bus within the confines of the lane markings. Both captains will have to manage these diversions expertly. One could say that Australia’s overseas assignments in Sri Lanka and South Africa have exceeded the expectations of a team that is in ‘re-build mode’. However, Australia will look at key moments in both these series and will want to ask questions. Being bowled out for 47 at Cape Town was a stunning low-point. At home they have been stymied by a plucky New Zealand side. The Kiwis used the conditions better at Hobart after being outplayed at The Gabba in Brisbane. The loss at Hobart to New Zealand just prior to the “Agneepath Series” will hurt Australia. Going into the last day, one could not imagine Australia losing. Yes, New Zealand (and in particular, Doug Bracewell) bowled brilliantly. However, the bowling was hardly menacing. What was scary — from an Australian perspective — was the tentativeness and mental fragility that was on display. Apart from Warner and Lyon, briefly, all the other batsmen poked prodded and perished. This slide to ridiculousness was started by Ricky Ponting. Until the Ponting dismissal, one could not imagine an Australia loss. Ponting spent 51 minutes out in the middle. 51 minutes of extreme self-doubt. 51 minutes that defined Australia’s loss. 51 minutes of agony for any Australian fan. 51 minutes of pain. Another major concern for Australia is the litany of injuries. While Watson is expected to recover in time for Boxing Day, the return of young gun Patrick Cummins is unknown at this stage. Shaun Marsh should return to his spot at 3. The fitness status of Ryan Harris is unknown. While the return of Watson and Marsh is welcome news, they will be short on (recent) match practice. The Big Bash League is the only cricket available for Watson and Marsh to secure match practice; and a hit in a T20 game is hardly the ideal preparation for Test cricket. And while on this topic… Who thought of having a domestic T20 competition in the middle of a first class season, and while the home Test-series is on? Even the BCCI wouldn’t have come up with this pearl of extremely bad programming. The BCCI office bearers would have had to be on a terrible cocktail of hallucination-inducing drugs and vodka to have come up with such a silly concept! The scheduling is so terrible that even if Patrick Cummins’s injury heals prior to the Adelaide Test — commencing 24 January 2012 — he would have to make an entry into Test cricket without any first class cricket under his belt. As a Team India fan, I have seen many ridiculous attempts at non-management by the BCCI. But this piece of ridiculousness is something that would make even the BCCI officials reject with extreme and violent disgust. India’s preparations have hardly been ideal either. An injury cloud hangs over Zaheer Khan. He has played two first-class games for Mumbai in the domestic Ranji Trophy competition. The comeback signs are good. But, will he last the tour? For India to have a successful tour, his form and his bowling-leadership will be crucial. One is never sure when Ishant Sharma will break down. For some time now, his body appears as though it is being held together by band-aid. Sreesanth is injured. Praveen Kumar is injured. Varun Aaron is injured. Harbhajan Singh is injured. Munaf Patel is injured. Ashish Nehra is not injured, but is not in selection contention. Who knows why? This means that the Indian bowling sports a new, young (and somewhat untested) look about it. Zaheer Khan, Ishant Sharma, Umesh Yadav, Abhimanyu Mithun and Vinay Kumar form the pace attack while R. Ashwin and Pragyan Ojha form the spin strength. While the rest of the team was playing against West Indies in an ODI series, a lead party of Sachin Tendulkar, Rahul Dravid, VVS Laxman and Ishant Sharma reached Melbourne prior to full squad assembling in Canberra for the two practice games. India is scheduled to play an Australia Chairman’s XI for a pair of 2-day games. Typically this side is a clutch of rising domestic stars led by a seasoned veteran. However, since the Big Bash League will have commenced on 16 December, it will be difficult for Cricket Australia to provide a competitive side to play against India. So, will it be adequate match practice for the visiting India Team? We do not think so. The senior Indian players value structured practice sessions more than practice games. While there is plenty of time for that, what is lacking is net bowlers. CA is under no obligation to provide them net bowlers until when the Tests commence. So there is a scheduling mess here too — once again, caused by a senseless T20 competition that carves up the domestic Shield season in half. India will, therefore, need to ensure that it takes an additional pace bowler on the trip. Either that or India needs to make do with Abhimanyu Mithun and Vinay Kumar bowling ball after ball to the batsmen in the nets! The lack of net bowlers is not a new problem that Indian teams have faced in Australia. This issue has surfaced on past tours to Australia too. Net bowlers have often been unavailable and practice facilities have often been “off limits”. Throw downs from the trainer are hardly going to prepare any batsmen — however experienced — for the probing examinations and searing pace of Peter Siddle and James Pattinson. So, there you have it. It is a strange series that has more doubts than Agnee (fire). And if the teams have a path towards a certain future, this is unknown either. Yet, what we do know is that this has been billed as the Agneepath Series. It represents a battle between a team that is trying hard to rebuild and a team that has to ensure that a rebuild is unnecessary. An Australian team that is in transition presents India with her best opportunity yet of securing a series victory in Australia. India has challenged Australia’s dominance in the glorious decade that Australia has had. India twice ended Australia’s record-winning sequences. It is now an opportunity to achieve what South Africa and England have both recently achieved — a win in Australia. For India’s greatest generation of cricketers this is the last chance saloon. A week ago I wrote that there were more ‘positives’ emanating from India’s loss to South Africa in the Cricket World Cup 2011. One of these ‘positives’ related to India’s possible QF opponent. If India had finished top of Group-B, her opponent would have been Pakistan (according to my prediction then). I had attempted a prediction of the results of the remaining games and hence, a prediction of the QF line up too. All of these were correct calls, I believe, apart from my prediction of last nights’ game between Pakistan and Australia. I should have listened to the heart and not my mind when I made that call. You never know with Pakistan. I should have stuck with the heart and predicted in favor of the mercurial unpredictability of Pakistan. I did just that several weeks back when I had primed Pakistan and South Africa as the eventual finalists of WC2011. That early, risky and flame-worthy prediction is partially vindicated at the half-way stage of the World Cup because Pakistan and South Africa have topped their respective groups. So why the change of heart/mind from Pakistan to Australia in last week’s result predictions? The change of heart/mind was mainly because of Michael Hussey’s presence in the Australian team. Hussey lends stability to a middle order that is struggling with a weak Ricky Ponting an unsure Michael Clarke, a ‘lost’ Cameron White and an over-rated Steve Smith. Michael Hussey, who entered the squad as a result of Doug Bollinger’s departure, offered stability and sanity where there appeared to be neither. That was the only reason I had changed my original prediction from Pakistan to Australia. However, even Hussey wasn’t able to prevent a Pakistan win in last night’s game. I do believe that this Australian team needs a lot of re-work to be resurgent in world cricket. Change is necessary. And that change is right at the top. Ponting must morph himself or he must go. Australia’s woes run deep at the moment. They could still win the World Cup from here. However, despite the proud and significant 34-match run of World Cup victories — interestingly, sandwiched by two losses to Pakistan in 1999 and 2011 — the chinks in Australia’s armory are worse than Ponting’s scowl might reveal. The scowl has now deepened into a semi-permanent fixture on his face. Ponting is not just going through a rough patch. It is now a horrible patch. He is a proud man who protects his significant impact on the game with the fierceness of a terrier under attack. The now dreadful series of Ashes losses look terrible on his CV. He would like to redress that imbalance by visiting England again. And for that he must win the World Cup. He must know that only a World Cup win will protect his place in the Australian team. I doubt he will play under another captain — that is just not the Australian way. 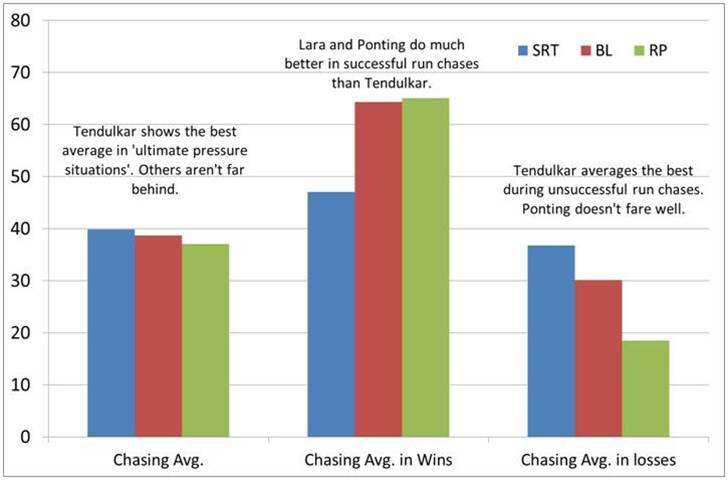 Moreover, there was a time when Ponting appeared to be catching up on Sachin Tendulkar’s career aggregate, average and number of centuries — somewhat meaningless first-order measures of a batsman’s impact on the game. My sense is that Ponting worries a lot about things like that too. 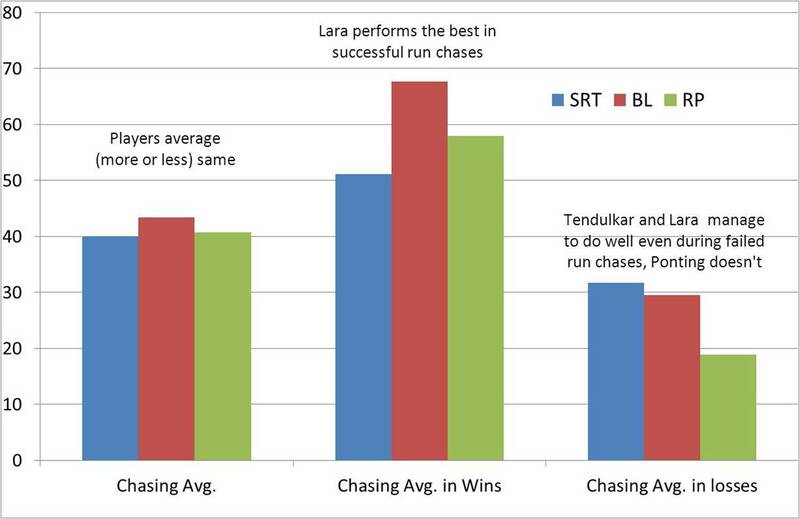 Over the last 18 months Sachin Tendulkar has hit a surreal patch of sublime resurgence. He has put daylight between himself and Ponting in these stats tables. I think that that daylight and the Ashes losses are weighing heavily on the mind of the Australian captain. He is just not playing like he can (or indeed, has). A few months back, Ponting alluded to Sachin Tendulkar’s sublime form and indicated that he would draw inspiration from that resurgence. I personally think he has put too much pressure on himself. He is playing with less authority and composure these days than ever before. He reminds me of the unsure Ponting that suffered in India in 1998. And that lack of confidence reflects on his team. Meanwhile, India has a somewhat important match coming up in a few hours’ time. I say “somewhat important” because the result doesn’t really matter as far as I am concerned. If India wins she will play Australia in the quarter finals (QF). If India loses, she will play Sri Lanka in the QF. Although I would have preferred India to meet New Zealand in the QF, she must either beat Sri Lanka or Australia in Ahmedabad to progress to the semi-final. Either of these QF opponents will do. Both Sri Lanka and Australia are terrific teams — I say that, despite Australia’s batting woes. Sri Lanka suffers from the same woes, in my view. Apart from Mahela Jayawardene and Kumar Sangakkara, there is nothing much in the Sri Lankan batting. So as a result of todays’ match against West Indies, India will face either a strong bowling attack (Australia) or a slightly stronger bowling attack (Sri Lanka). In either scenario, India’s batsmen will have to do the job of scoring a large number of runs and put the opposition under pressure. In today’s game, India needs to sort out her team balance and commit to it regardless of the result. There are some doubts over Sehwag’s fitness. I cannot see how Ashwin can be left out. India has a 15-member team in which two players rule themselves out due to “confidence” problems. One player — Sreesanth — does not appear to have the team captain’s confidence and another player — Piyush Chawla — who, by his own captain’s admission, does not have self-confidence. So that automatically makes this a 13-member team with two players fighting to be drinks’ carriers! Therefore, given Munaf Patel’s reasonable performance, through a process of elimination, the only choices that need to be made are which ones of (a) Suresh Raina or Yusuf Pathan, (b) R. Ashwin or Ashish Nehra. It appears that the current choice is for Suresh Raina and R. Ashwin. Interestingly, both play for Chennai Super Kings! Call it luck or the whatdoycallit-red-dot-on-forehead syndrome. In an article on the Umpire Decision Review System, the UDRS, I alluded to the umpires assistance system drawing two distinct and different responses from captains in two countries separated by the Indian Ocean. The Boxing Day Test matches at the MCG and Kingsmead, Durban, saw Ricky Ponting and Greame Smith pull their hair out at the UDRS — the former because it was there and, in his view, implemented wrongly and the latter, because it just wasn’t there! In South Africa and in Australia, we had two captains acting in somewhat strange ways. Fast forward to the eve of the New Years’ Test matches in Australia and South Africa and we again have two mystifying cases of captains doing things in strange ways. On the eve of the RSA-India Test match, the hot-headed, ill-tempered, motormouth, Sreesanth received a public rebuke and a dressing down from his captain, MS Dhoni. On the eve of the Australia-England Test match, it was Ricky Ponting and not Michael Clarke who responded to the Australian Prime Minister Julia Guillard’s speech. Both of these were examples of bad leadership, in my view. One thought he had learned his lessons. But no, a few months later, he got slapped by Harbhajan Singh and immediately broke down and cried on the field. Subsequent to that the BCCI warned him that he was on a suspended sentence for bad behavior for using foul language against Dhawal Kulkarni in an Irani Cup match. A contrite Sreesanth said we would all see a new-and-improved man on the ground henceforth. A few months later, he was fined for dissent during the IPL. His is a case of a talented bowler doing more with his eyes and mouth than with his excellent wrists, when bowling. His is an example of an errant boy who just refuses to grow up. His over-the-top antics, which were once “cute” are now becoming an acute embarrassment to a fan of Team India. At the top of his run up, prior to bowling every ball, Sreesanth pumps his hands two or three times in a motion that seems to suggest “Stay calm and focus”. Somewhere between that motion and when he actually delivers the ball, his brain appears to either get fried or tired. What usually happens then is a stare or a glare or some foul words delivered in the direction of the batsman. The day is not far away when an opposition batsman will hit him with a bat. The BCCI and the Team India captain needs to ensure that their motormouth is adequately insured from such an eventuality. Story is that in Durban, Sreesanth invoked Greame Smith’s mother in a colorful sledge delivered at the South African captain. An irate Smith waved his bat at the foul-mouthed Indian bowler, lost his head and immediately lost his wicket too! Dreadfully sad? No. Not really. My own view is that those who throw stones in an open and filthy drain should not be allowed to dictate the chemistry of the liquid that splashes back at them. However, that said, there is apparently a “line” that cricketers do not cross. Don’t ask me why that line exists. I’d be all for an all-or-nothing approach where one can bring in anything and anyone into a sledge! I am yet to see the Mafia’s published rule book on honorable and dignified methods of killing, for example! However, the fact is that Graeme Smith was extremely upset that the cricket field was a place where Sreesanth wanted to conduct a discussion on his mother! Smith complained to Dhoni. Dhoni washed dirty linen in a press conference and reprimanded his player through the media! I thought that that was a strange case study in bad leadership; strange because Dhoni always comes across as a man who is correct and yet clear in everything he utters. This was certainly very strange. Mind you, Sreesanth, as I said before, does repeatedly cry out to have his head kicked in. But to do that through the media either indicates a bad hair-day for Dhoni or that the India captain is at the end of his tether! Either way this is practice of bad leadership. Across the Indian Ocean, we witnessed another stark example of bad leadership. Ricky Ponting had just vacated his post as captain of the Australian cricket team. Micheal Clarke was appointed caretaker captain for the last Test against the visiting (and already triumphant) England. Instead of leaving the controls in Clarke’s hands and disappearing from the scene, Ponting indicated that he would hover around the team in the dressing room! This was remote-control leadership. It just does not work. The bus was being driven by Michael Clarke, but Ponting’s hand was firmly on the wheel! For example, at an official reception to the teams it was Ponting that responded to a welcome by Australian Prime Minister, Julia Guillard. In my view, these are two examples of questionable leadership on the same day! Team India are poor travelers? In the last few days, two very interesting victories have made cricket interesting once again. India won at Kingsmead, Durban and England clinched The Ashes with a famous victory at the MCG. For sometime now, I have been maintaining a list of some of the most thrilling Indian Test Cricket victories in recent times. I have added to this list, India’s victory on 29 December 2010 at Kingsmead, Durban, South Africa. The addition of “Durban 2010 v South Africa” to this impressive list is because it was once again a come-from-behind victory after a terrible loss in the 1st Test of the series (at Super Sport Park). The Durban victory is an important victory for Team India because it goes a long way towards debunking a myth — yet again! — that India plays badly overseas. Is it important for India to debunk myths about her ability to play overseas? I think it is enough if India plays well every time she takes the field — regardless of where it is. And that is exactly what Team India has been doing in the last decade. There are trash-talkers who wish to talk with their mouths and then play, sometimes simultaneously and almost always, to their own detriment — as Graeme Smith found out quite rudely in the Durban Test match! Greame Smith can believe the myths he creates to make himself happy about his lot in life. These myths have a strange way of enveloping the myth-creators. When that happens, the inevitable outcome is a simple pin-prick that results in a painful deflation of the balloon of arrogance. The myth-creators are often blind-sided by the myths that they create! In the last decade, India has won 22 and lost 20 of her 61 overseas Tests for a win/loss ratio of 1.1 and a draw/loss ratio of 0.95. In the same period, when compared with the performance of South Africa, Australia, England and Sri Lanka, the corresponding figures for Australia (for Wins, Losses, Total Overseas Tests, W/L and D/L) are clearly the best at 34, 16, 59, 2.12, 0.56. The figures for South Africa are: 21, 18, 56, 1.16, 0.95. The figures for England are 19, 23, 62, 0.82, 0.86 and those for Sri Lanka are 11, 19, 39, 0.57, 0.47. Clearly, Australia has the best win-loss ratio, thanks to Australia’s stunning performances when Steve Waugh (and then Ricky Ponting) captained an excellent team with Hayden, Langer, Ponting, Waugh, Martyn, Waugh, Gilchrist, Warne, McGrath, Gillespie et al. India’s win-loss ratio in the same period compares favorably with that of South Africa and puts into shade, the win-loss performances of Sri Lanka and England. The draw/loss ratio is not a metric that is often used in comparative analyses of this sort. It is, in my view, as important as the more obvious win-loss ratio that is used almost always. It is a pointer to a teams’ grit and resolve — especially when it plays in unfamiliar conditions. A draw might not be a pretty sight. But it is a pointer to a teams’ grit in tough situations. The above figures might show Australia in poor light as a team that has an inability to grit it out. But this might be more due to the rather refreshing “win at all costs” attitude Australia used to employ in the early part of this decade. But India has drawn almost as many Tests as she has lost in overseas Tests! Team India has an impressive draw-loss ratio and an acceptable win-loss ratio that is constantly improving. For example, if we take just the last 5 years, the win-loss and draw-loss ratios are 1.44 and 1.33 for India, 1.66 and 0.89 for Australia, 1.62 and 0.875 for South Africa, 0.6 and 0.86 for England, and, 0.7 and 0.6 for Sri Lanka. Overall, apart from the impressive Australia team — and that too, in the first half of this decade gone by — India stacks up really well with other top teams in terms of her “overseas” performances. So, in my view, it is time we start debunking these myths about Team India being poor travelers. To me, with the addition of the latest victory at Kingsmead, this big-list list of recent Indian Test victories reads: Kolkata 2001 (v Australia), Leeds 2002 (v England), Adelaide 2003 (v Australia), Multan 2004 (v Pakistan), Sabina Park 2006 (v West Indies), Johannesburg 2006 (v South Africa), Perth 2008 (v Australia), Mohali 2008 (v Australia), Chennai 2008 (v England), Colombo, P. Sara 2010 (v Sri Lanka), Kingsmead Durban 2010 (v South Africa). It is fair to say that, with a few days to go to the end of the current decade, the period from 2001 to 2010 has represented an exciting decade for Indian cricket. We have seen some exciting talent explode onto the scene — MS Dhoni, Yuvraj Singh, Harbhajan Singh, Zaheer Khan, Virender Sehwag and Gautam Gambhir, to name a few. We are seeing a few young turks itching to have a crack on the big stage — Suresh Raina, Virat Kohli, Cheteshwar Pujara, M. Vijay, Pragyan Ojha and Ishant Sharma, to name a few. And this entire march has been presided over by the “Famous Five” or the “Fab Five”; five of the best gentlemen to grace Indian cricket together in the same team. One of this quintet — The Famous Five — was responsible for this sensational victory in Durban. The smiling assassin, V. V. S. Laxman, carefully scripted this impressive victory. And with this victory, the world might start accepting that a green-top is as useful to India as it is to the host. In conclusion, let us debunk two myths: One, that India are poor travelers. Two, that a lively pitch only assists the home team when Team India visits! While we are on the topic of green-tops, how is it ok for Graeme Smith or Dale Steyn to “request” for green-tops against India while a “request” for a spin-friendly wicket in India by an Indian captain or player is frowned upon when Australia or South Africa visit Indian shores? I have never heard a visiting Indian captain whine about the state of pitches in Melbourne, Leeds or Durban? Isn’t it time that captains that visit the sub-continent lock their whine-vocal-chords at home before they board the plane? While I exist in this paranoid state, am I the only one to believe that if Ricky’s surname was not Ponting, but either Singh or Kumar or Khan, he would have been suspended for his totally over-the-top antics at the MCG? Had I been the umpire and had an on-field captain carried on like a pork chop the way Ricky Ponting did, I would have searched for a red card and thrown the man out of the park! The fact that Aleem Dar tolerated the Ponting “carry on” was a testament to the umpires’ patience. The fact that the match referee slapped a mere fine on Ponting means that, to me, the Match Referee’s office is, once again, shown up for the disgrace it is. The fact that Cricket Australia did not suspend Ricky Ponting immediately means that the “Spirt of Cricket” document that all Australian cricketers sign up when they get the Baggy Green needs to be torn up immediately and re-written in an environment of grace and humility.